The new Oracle Data Mining 10gR2 Tutorial has is now posted to OTN. Oracle Data Miner 10.2.0.1 Tutorial (7MB) Apr 2006 (link to download zip file). The link downloads a Zip archive that contains the tutorial in PDF format, a dump file containing tables used in the tutorial, and demo_import_mag.txt, the file used to illustrate File Import. This is a great document for users to get started using Oracle's Data Mining functionality. Link to Oracle Data Mining page on OTN. Steven Chan, Director, Applications Technology Integration, has recently started a blog (link to blog, link to RSS feed) called "Oracle E-Business Suite Technology". As Steven descibes it, the blog is an "insider's take on technology stack-related topics for the Oracle E-Business Suite, with the occasional product announcement, glimpses into the inner workings of Oracle Development, editorials on business philosophy, and musings on IT industry news." Discoverer customers who use the product with the Oracle E-Business suite should find this interesting, as announcements related to Discoverer versions and their certification with the EBS (sorry, this is probably not an approved abbreviation that I should be using...) would be covered here from an expert insider's perspective. OTN has published a sample chapter (Ch-1) from Michael Armstrong-Smith's latest book, "Oracle Discoverer 10g Handbook", an Oracle Press title, and published by McGraw-Hill Osborne Media (link to Michael's site and blog). Here is the link to the sample chapter - it is a PDF file, 19 pages long, 285KB in size. Here are the results from the poll - close to 300 votes were received (less than I had expected), and thanks to everyone who voted. I shall be closing the poll for the features you absolutely want to see in the next release of Discoverer tomorrow morning (link to poll). If you haven't already voted, do so - it takes only a minute. - This confirms that there has been continuing confusion and indecision within Microsoft over the direction to take with respect to its BI Tools strategy. Does anyone remember Data Analyzer? This was something Microsoft used to pitch some 4-5 years back as a BI adhoc query tool. Then they stopped talking about it. Completely. Sometime in 2003 came the Reporting Services announcement. Microsoft realized they still did not have an adhoc tool. So they bought ActiveViews, and renamed it as "SQL Server 2005 Reporting Services Report Builder". Oh and yes, they also have something called 'Excel Add-In for SQL Server Analysis Services', that they no longer talk much about. Not to mention that Excel 2007 is supposed to have lots of BI capabilities built-in. And what about Excel services? - Where does this leave the independent BI vendors? I had said this before that Microsoft had been deliberately not playing in the tools space as aggressively (that they had no clear positioning or articulation of strategy or half-decent product was another matter) and instead been focussing on building up its BI platform capabilities. It was content to have its partners build market and mindshare for its products and technologies like Analysis Services and XMLA. Now it is harvesting time. These BI vendors deserve a medal for having worked so hard and dilligently for Microsoft. As Murphy would say, "no good deed shall go unpunished" (link). A poser to the BI vendors, "ab tera kya hoga kalia?" (link to Reference.com and Wikipedia for those not familiar with the Indian movie 'Sholay'). I posted a poll on Friday (link), asking people to vote for their must-have features in Discoverer. I want to close this poll in a day or two, so this is a request for all people to take a minute and take the poll (click here to go to the post and vote) and also read some pertinent background information on the poll. You can also drop me a line at abhinav.oracle at gmail dot com for more detailed feedback or anything you want treated in confidence. I am absolutely delighted to post this: on Friday evening I received an email from Oracle's marketing team that Michael Armstrong-Smith (link to Michael's web site, link to Michael's blog) had been nominated to receive the Oracle ACE award for his substantial and excellent contributions to Discoverer in the Oracle technical community. His profile should be added shortly to the Oracle ACE page (link). 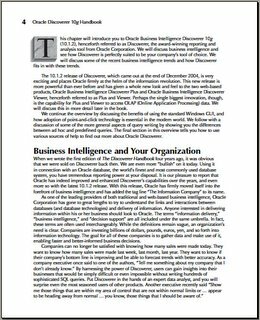 - In 2000 he wrote the original Discoverer Handbook, and in 2006 the updated Oracle Discoverer 10g Handbook was released by Oracle Press. The first book achieved a top 200 rank among all books on Amazon.com, while his second book has already reached the top 5000 in less than two weeks of its release. - Between Metalink and OTN Forums he has answered over 600 posts and is one of the most prolific and knowledgable person out there. - And he is a frequent presenter at different Oracle events and user group meets. Once again, congratulations to Michael! The good news is that the features people asked for are the ones that we have been hearing from customers, the sales force, and others - so the good thing is that there are no surprises there! The even better fact is that the new Oracle BI suite Enterprise Edition has all these features and a lot more. For example, you can do very nifty alerting and distribution using 'Delivers' in the Enterprise Edition, with the ability to send alerts to different devices. 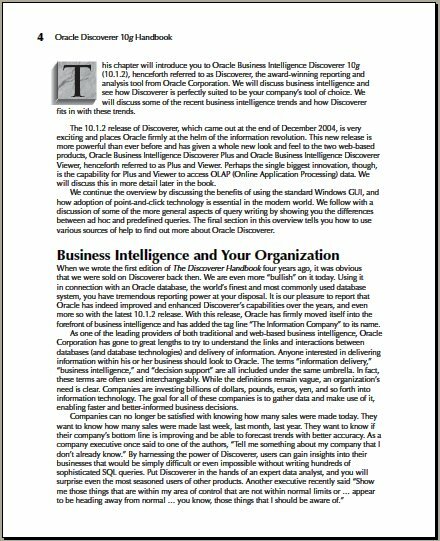 There is a flip side to all this however - as you would have read in various web sites and through announcements (link to Google News) and on this blog itself (link to post, link to post on Oracle's BI briefing) that there are now three editions of Oracle Business Intelligence: Oracle BI Suite SE One, Oracle BI Suite SE, and Oracle BI Suite EE. While Oracle Business Intelligence Standard Edition (link to page on OTN) comprises Oracle Discoverer, BI Beans, Reports, and other products, the Standard Edition One and Enterprise Edition suites are built upon the analytics server that Oracle got from its Siebel acquisition. These two suites offer a lot of additional functionality, including many features that customers have been asking for in Discoverer. 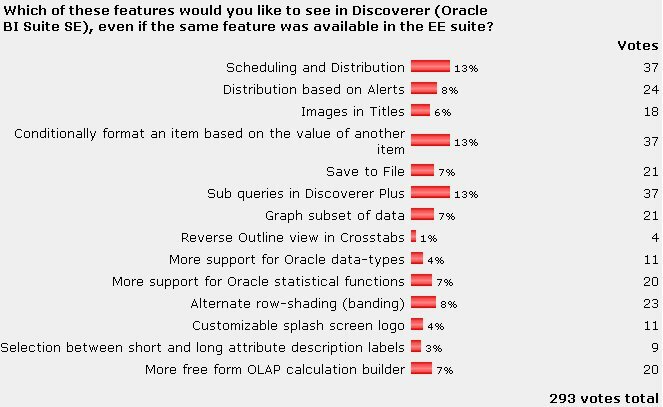 Separately, Oracle has also committed to making Discoverer essentially a data source to the analytics server, which means that for those customers interested in adopting the Enterprise Edition, they would be able to leverage their existing investments in the current Oracle BI stack. 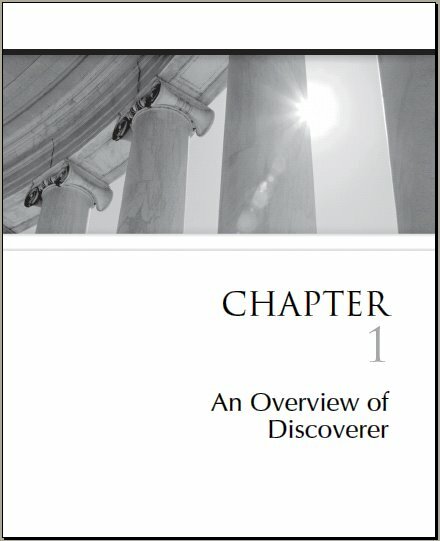 Those customers that want to continue using Discoverer will be able to do that also, as we have committed to providing enhancements on top of Discoverer, in addition to Oracle's policy of providing lifetime support (link to the Discoverer statement of direction on OTN for more specific details). Also see Oracle's Lifetime Support Policy FAQ document (link to doc). Therefore, a question that assumes more importance is that from among the basket of requirements that customers have, which are the ones that they would specifically want to see implemented in Discoverer. If I have left out any choices that you think are important enough, do drop me a line at abhinav.oracle at gmail.com. 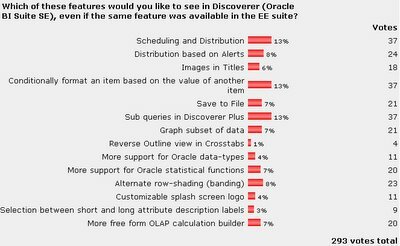 Which of these features would you like to see in Discoverer (Oracle BI Suite SE), even if the same feature was available in the EE suite? Note that you can select more than one choice before clicking the 'Vote' button. Disclaimer: while it should be obvious to most people, I still do want to state that this is not a commitment to deliver any functionality in any stated timeframes. Your responses shall help, certainly, and are an invaluable input into our planning. This blog, I hope, provides a quick way to elicit informed opinions from our customers, partners, and others interested in Oracle BI.